The truth is that organizing a wedding is troublesome. There are so many things that will go through your mind and it is really easy to end up feeling so overwhelmed by the fact that expenses keep appearing while control is lost. The good news is that you can always save money and control costs. You just need to know exactly what to do. The infographic below will not actually offer all the information that you need but it will put you on the right path. Consider the advice to be your starting point. It will help you out a lot. 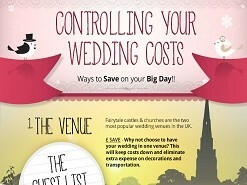 The infographic highlights 14 different ways in which you can keep wedding costs down. Consider absolutely all of them. We understand that some may be controversial. The one about the wedding dress is always substantial. It is obvious that you are faced with a dilemma in this case since the advice is to rent your wedding dress but most women out there want to be sure that they have the dress forever and ever. You cannot always save money because of personal reasons but it is a guarantee that out of the various tips highlighted by the infographic you will find some that you can take advantage of in order to actually control wedding costs. Remember that your wedding does not have to be as expensive as you initially thought it was. Unfortunately, many try to take advantage of you during this moment in your life. It is really important that you are careful and that you do not overspend. While the tips in the infographic help you out a lot, there are situations in which other tips can aid you so be sure that you also read articles that talk about this online. The truth is that basically all you need to remember about controlling wedding costs is available online. Start with the infographic below, read it and see if there are options that are available for the wedding. You never know if there are options that you can use to control those wedding costs. You just need to allow yourself enough time to see what to do. PREVIOUS POST Previous post: How Much Does Darth Vader’s Costume Cost?